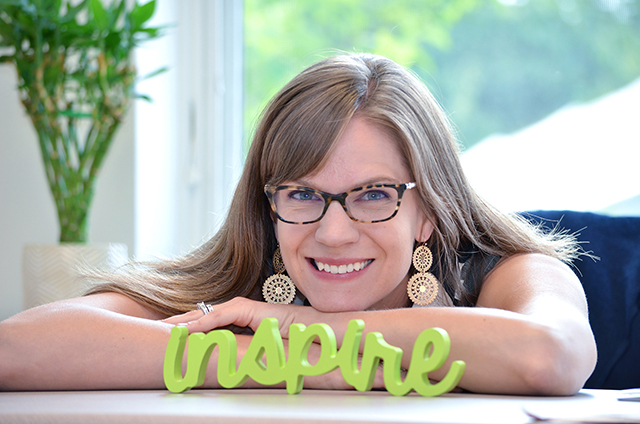 Kendra McCuine, M.Ed, teacher and director of the Hope Graham Program (HGP) at Bancroft School, writes about the beautiful and amazing dyslexic brain. Read on and discover further proof of what Hope Graham students already know: Dyslexia is a difference, not a disability! Giving Thanks for Deep Reading! All of us have seen remarkable changes in the technology available to us and our students over the last ten years. Over the course of the last decade, 1:1 iPads and Chromebooks have become commonplace in schools and smartphones have come to be seen as a necessity rather than a luxury for adults and many kids. The results of this technological shift have been phenomenal in some respects: for example, software now exists that enables students to take a picture of a document and then have it read to them with a reasonable degree of accuracy. “Ear reading,” or listening to books, high-quality speech to text, and a variety of digital note-taking platforms are now commonplace, improving accessibility and productivity for all students. Yet some believe that this level of productivity comes at the cost of our ability to slow down and read deeply. Dr. Maryann Wolf, a renowned reading researcher, published her first book Proust and the Squid: The Story and Science of the Reading Brain ten years ago. This book is a remarkable account of how our brains, in relatively recent history, capitalized on existing systems in order to develop the ability to read, and why dyslexic brains have a hard time with reading. A decade later, she has put out her second book: Reader, Come Home: The Reading Brain in a Digital World, in part as a response to the very shift that had occurred while she was composing her first work. In this recent text, Wolf writes, “In the seven years it had taken me to describe how the brain had learned to read over its close to six-thousand-year history, our entire literacy-based culture had begun its transformation into a very different, digitally based culture.” It is this digitally based culture in which our current students, the first generation of “digital natives,” are growing their reading and thinking capacities today. So according to Dr. Wolf, how might the digital world impact our children’s neural networks? For one, the incredible amount of digital information available has not changed our cognitive capacity. We still have the same amount of attention to pay to any one piece of writing. Yet with so many of them available, that attention is often split among a number of texts rather than focused on just the one in front of us. An analogy that we often use with students is that of an iceberg: the information in plain view is just the beginning, while the most important and interesting information that a text provides lies beneath the surface. When students (and adults) become accustomed to quickly reading a high volume of text, it comes at the cost of deep, slow analysis below the text’s surface. Another impact that the digital world has on reading is the way in which we navigate text. I’ve heard the difference between reading digital and hard-copy text be likened to that between navigating a city using GPS or a paper map. GPS provides street-view instructions one step at a time. Likewise, readers of digital text may be more apt to focus on one page or piece of information at a time, not relating it to the overall picture of the work. On the other hand, a city map provides the user with context for each piece of information encountered, just as a paper text allows the reader to more easily relate the section they are currently reading to the book as a whole. Certainly digital text is not going anywhere anytime soon. And given its benefits, we wouldn’t want it to. But as teachers, parents, and caregivers, we have the amazing opportunity to ensure that our children are still able to slow down, savor, and think deeply about some of what they read. Bancroft teachers take advantage of this opportunity often, through assigning hard-copy books, engaging students in deep reading activities, and designating particular times of day purely for reading physical texts. This Thanksgiving break, I invite us all to slow down and immerse ourselves in some non-digital reading. I’ve challenged each of our HGP 8th graders to read a full book during the break. And all of our HGP students will take part in our traditional “Mrs. McCuine’s Reading Challenge,” in which I challenge HGP as a whole to read a certain number of hours (85 this time around) and reward them with an ice cream party if they meet their goal. Whether you and your child read a hard copy book together, read separately, or listen to an audiobook, it will be time well-spent. How do HGP students own their learning? Certainly through the voice and choice offered to all Bancroft students. But in HGP, that phrase means more than students having a say in what they learn, how they learn it, and how they show what they know. It means owning their learning profiles, and by extension, owning who they are as learners. In addition to skill-building, this is the most important goal of HGP. Armed with their inquiry questions, students delved into research in search of answers. They consulted a variety of websites geared towards and parents and children with learning differences and watched videos from renowned experts. Perhaps most impactful was the visit that a local neuropsychologist made to their class; they spent a full hour peppering her with intelligent, well thought-out questions. I didn’t see myself as a learner before, and now I do. I’m already taking more ownership. If you know more about yourself you shouldn’t think that you’re different because everyone’s equal in their own way. I find it cool that I have dyslexia! All of them agreed that future students should definitely do this project. Students and teachers alike are seeing the fruits of this project in the forms of increased motivation, self-advocacy, and investment. They are truly owning their learning (profiles)! Executive Function Spotlight: How to Make Mornings Easier! Dyscalculia (difficulty learning numerical concepts and operations). Yet even after gaining the skills they need in order to succeed academically, many kids (and adults) with learning differences still struggle with goal-directed behavior such as planning, organizing, self-monitoring, and follow through — a group of skills known as the “executive functions” or EF. The impacts of EF difficulties in school are obvious: forgetting to bring materials to class, difficulty getting work done on time, struggling with multi-step problems and tasks… the list goes on. But as parents, we often see these struggles play out at home too — especially when we’re trying to get everyone out the door in the morning. Two Bancroft Middle School colleagues and I recently attended an executive function seminar lead by Sarah Ward and Kristen Jacobson of Cognitive Connections. While we are currently sharing what we learned in terms of the classroom with our fellow Bancroft teachers, I’d like to share with you all some tips we picked up about how parents can help their kids with EF at home — especially in the mornings. I once heard a piece of trivia on the radio that the half hour before school starts is the most stressful part of the day for parents. And it’s no wonder! Both kids and adults have a monumental number of tasks to carry out each morning, and each task contains several mini-tasks. A child or teen might be expected to get dressed, pack their bag, prepare and eat their breakfast, gather what they need for extracurriculars, brush their teeth and hair, and put on any outdoor gear they need according to the day’s weather. Each of these jobs contains micro-jobs; for example, preparing and eating breakfast necessitates evaluating what you’re in the mood for and checking what’s available, assessing how much time you have to make and eat your meal (should I have pancakes or toast? ), following the steps to prepare what you’ve chosen, and eating it without becoming distracted. Kids don’t always have the underlying skills necessary to carry out tasks that seem fairly simple to us adults, but upon examination can be fairly taxing on executive functions. Ward and Jacobson pointed to a mistake that parents and teachers often make: the checklist (I’m guilty of this too)! For many households, checklists just result in mom and dad reminding kids to look at the checklist and/or kids needing guidance and prompting to get through the mini-tasks inherent to each item on the list. If our goal is to get our children to independence, checklists just don’t cut it. According to Ward and Jacobson, the reasons why checklists don’t work has to do with working memory. Working memory is one’s ability to hold onto and work with visual and verbal information. Executive functioning starts with visual working memory. Take a moment to plan your evening. Did you simply say what you were going to do, or did you picture each activity? Odds are, you either pictured each step in your head, or you both pictured and said each step. It’s unlikely that you would only say each step. Yet that’s exactly what checklists are — a verbal version of processes that need to first be imagined visually. When we give kids checklists, we bypass visual working memory and therefore the first step of strong executive functioning. Checklists won’t build EF on their own, so if we want to help our children reach independence, we need to take more intensive action. Ward and Jacobson assert that to build independence, checklists must be accompanied by visualization, gesture, conditional language, and an understanding of time. Imagine that you’ve asked your child to prepare and eat her breakfast, and you have 15 minutes before you need to leave the house. Have your child take a moment to visualize herself going into the kitchen, looking in the pantry, choosing a breakfast item, preparing it, and eating it. (Adults do this all the time, but we do it so quickly and automatically, we rarely notice the process). As your child visualizes her plan, encourage her to talk through it using gesture. If she’s up in her bedroom, she might point downwards as she thinks about going downstairs, gesture opening the pantry and grabbing the box of cereal, mimic pouring it into a bowl, and point to the table where she’ll sit down. Encourage the use of conditional language. We often think of “probably” and “maybe” as weak planning words, but they’re actually great for EF. This is because they encourage your child to think about the unexpected. What if she gets down to the pantry and you’ve run out of cereal, or there are no clean bowls? Her plan and accompanying gestures might sound something like, “I’ll open the pantry to get the Cheerios, but if we’re out of those, then maybe I’ll grab the bread and make some toast.” Though visualizing and gesturing both the plan and the “maybes,” it becomes much more likely that she’ll follow through and not need your reminders. With the proliferation of digital clocks (especially phones), most kids don’t have the ability to visualize time. Even if you tell your child she has 15 minutes for breakfast, she doesn’t necessarily know what 15 minutes actually looks and feels like. 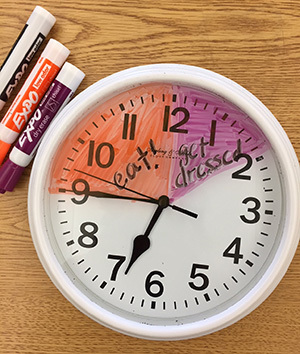 Consider investing in a cheap analog clock and a white board marker. Mark the start and end time on the clock with the marker, then color in the segment of the clock between the two times. Your child can then see the 15 minutes progressing towards the time at which you need to be out the door. Practiced regularly, seeing the sweep of time will help her to visualize timeframes in other contexts as well. Don't miss "Math & Reading Instruction for Struggling Readers: Where We Are and Where We're Going," with noted neuroscientist, researcher, and professor Joanna Christodoulou, Ed.D. — Thursday, April 26, 2018, 6:30 PM Reception and 7:00 PM Talk and Q&A. Bancroft Field House, 100 Shore Drive, Worcester. Special thanks to Todd H. Wetzel of The Wetzel Group at Morgan Stanley for sponsoring this event! In my first blog entry, “The Business of Changing Brains,” I outlined the research on the proven impact that Orton-Gillingham (OG) instruction has on students’ reading abilities. In the Hope Graham Program, we live the results of this research every day; the OG-based instruction that we provide in our small literacy classes and individualized tutoring sessions has a profound impact on our students’ ability to read (and often their excitement for doing so). Thanks to that research, we in the field of educating students with language-based learning differences (LBLD) know exactly what works for teaching our students how to read. What’s more, researchers have discovered the changes in the brain that result from such instruction. In the realm of LBLD, far more is currently known about reading than math. However, we do know a lot about the kind of instruction that is effective for our students. Direct and explicit instruction: Students know the goal of the day’s lesson. While math curricula often employ a “discovery method,” in which students intuit what they need to know from a series of examples, our explicit math classes provide students with the goal of the lesson right away. Gradual release of responsibility: We employ an “I do, we do, you do” framework, in which the responsibility for content and procedures shifts gradually from teacher to student, with frequent checks for student understanding along the way. Concrete to abstract instruction: Students work with hands-on or pictorial representations of abstract mathematical concepts in order to develop a solid understanding, gradually fading these out over time. This is something that all Bancroft math teachers do, but our explicit math teachers employ this practice for a longer period of time and with a wider array of manipulatives when necessary. Less focus on language: Most math curricula today have a heavy focus on language in addition to the math concepts taught. Students are expected to read lengthy explanations and express their understanding in written form. Our explicit math classes intentionally decrease both reading and writing loads during instruction, so that students can devote more cognitive energy to learning and playing with their mathematical understanding. Breaking down language tasks when necessary: Sometimes language tasks can’t be avoided in math class, such as when students learn math vocabulary or word problems. In these cases, our teachers directly introduce and frequently review math vocabulary. They also help students to break word problems down into their parts and translate each part into the language of math. One researcher, Dr. Joanna Christodoulou, is currently working to develop a better understand of what the neurological crossover is between reading and math difficulties. Dr. Christodoulou is a research associate at MIT, Adjunct Lecturer at Harvard Graduate School of Education, and Assistant Professor at the MGH Institute of Health Professions. While her research is still underway, she has developed several theories regarding neurological factors that may cause students to struggle with both language and math. This is very exciting work, as it may help us to better target the factors that cause some of our Hope Graham Program students to struggle in both areas, and more importantly, how we can better target their needs. I am pleased to announce that Dr. Christodoulou will be presenting her findings thus far, and her resulting theories, at our spring Bancroft Speaker Series on Thursday, April 26! She will also discuss her completed work on the “summer slump” that students with LBLD often experience in reading, and ways to prevent reading regression during this time. 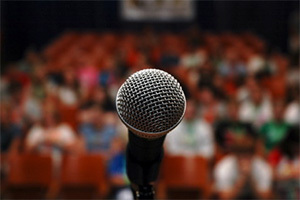 Bancroft Speaker Series events are free and open to the public. Stay tuned for registration information — coming soon! I encourage you to reach out to your child’s teacher if you have questions about how to support your child’s math learning at home. I hope to see you at our Speaker Series on April 26! Most people who are involved in, or at least familiar with, the Hope Graham Program know that we base much of what we do on Orton-Gillingham, or OG. Wondering what, exactly Orton-Gillingham is and how we implement it in HGP? Read on! In short, Orton-Gillingham is a method of teaching language that follows a specific teaching philosophy. We use it in HGP in two ways: (1) to teach our students how to read and spell, and (2) as the underlying teaching philosophy for all of the instruction that we provide. The foundation of OG instruction is the tutorial. When you hear about “tutoring” in HGP, we’re not talking about homework help or reteaching a skill taught in class. The tutoring we provide follows a very specific format that is considered the gold standard in building the reading skills of students with language-based learning differences. During tutorials, students are directly taught the letters and letter combinations that create sounds in our language, as well as the units of meaning (morphemes) that construct the majority of English words (Latin prefixes, roots, and suffixes and Greek combining forms). Phonological awareness activity: Students practice splitting apart, blending together, or changing around the sounds in words. For example, a student might be asked to count the number of syllables or sounds in a word, blend several separate sounds together to form a word, or to remove a sound from a word (“say straw without saying tr”). Phonics drill cards: Students name the sound(s) and keyword(s) for each letter or letter combination that they have been directly taught. For example, a student who has learned the three sounds of ea would be shown that letter combination on a card and say, “EA says e as in bread, a as in steak, and ee as in eat.” Students might also practice the morphemes that they have learned, or learn a new letter or letter combination. Word to read: Students read a list of words that incorporates both learned and new concepts. Students may also work on “nonsense words” in this section, which are made-up words that can be sounded out. Reading nonsense words forces students to fully use the sound-symbol associations that they have learned. Connected text: Students work with their tutor to read text at their reading level, working to directly apply the letters, letter combinations, and morphemes that they have learned in this reading. What Says? : Students are given a sound and asked to write down all of the letter combinations they know that make that sound. For example, for the ee sound, students could write down e, e-e (as in theme), ea, ee, and ie, if those are the letter combinations they have learned for that sound. Spelling: Students are asked to spell words containing the letter-sound combinations, sight words, spelling generalizations, and morphemes that they have learned. 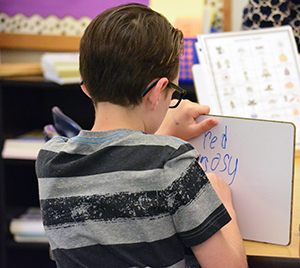 Dictation: Students hear sentences containing the letter-sound combinations, sight words, spelling generalizations, and morphemes that they have learned. Here, they must also focus on capitalization and punctuation. There are many published reading programs that are based on the Orton-Gillingham approach. These programs come with a predetermined sequence of lessons or activities, dictating the order in which a student sees particular concepts and the time she spends on each. Orton-Gillingham, on the other hand, fits each student individually. An OG teacher or tutor takes notes during each lesson on the student’s strengths and weaknesses, designing the next lesson specifically around what the student was and was not able to do in that session. In order to individualize to this level, OG practitioners go through an extensive amount of training and practicum time before receiving their certification. Planning an effective OG lesson requires significantly more time than a programmed lesson, as all of the content is targeted around each individual student’s current abilities. Systematic, cumulative, and cognitive. Concepts are introduced in such a way that they build on each other. Students have a sense of what they have learned, what is coming next, and how what they are learning builds on itself. Simple to complex. We teach the simplest concepts first, using them as stepping stones to more complex concepts. Concrete to abstract. We begin instruction with the tangible or familiar, using that as bridge by which students can access more general ideas that may be difficult to grasp. Diagnostic and prescriptive. Teachers consistently check students’ current levels of understanding and craft their lessons based on the information that these check-ins provide. Emotionally sound. Teachers enable students to experience success in every lesson, fostering self-confidence and motivation. Who Were Orton & Gillingham? Finally, you may be wondering where the name Orton-Gillingham comes from. The OG approach is based on the work of Dr. Samuel T. Orton and Anna Gillingham, which began in the 1920s. Dr. Orton, a neurologist, pioneered the field of language-based learning differences by studying children who showed signs of what we now call dyslexia and developing an instructional approach specifically for these students. Anna Gillingham, an educator and trainer of teachers, was responsible for developing Dr. Orton’s method into a teaching approach and training teachers to implement it. She also lay the foundation for what we now call “multisensory teaching,” theorizing what we know to be a very strong link between auditory, tactile, and kinesthetic ways of learning and storage in memory. In the Hope Graham Program (HGP), we believe that enabling students to name their challenges empowers them to understand when and why they struggle. A student who can confidently say, “I am dyslexic” knows that he or she is a bright student whose brain is not optimally wired for reading, not a student who is dumb. Students who know that they have expressive language challenges understand that they need some time to think before responding, some sentence starters to get the words flowing, or the opportunity to talk around the idea they’re trying to express — and that these are just tools to help them express what they already know. Most importantly, by naming their challenges, our students have the opportunity to realize that those challenges are only a sliver of their overall identities. At Bancroft, a student might see himself as a student who is great at robotics, a quick math problem-solver, a kind friend, dyslexic, and a strong lacrosse player. Or she could be a curious scientist, member of the Lower School Leadership team, dyscalculic and ADHD, and star of the fifth grade play. “I am in 5th grade and am 11 years old, like your son Barron. I am Dyslexic and have ADHD. I want to explain how I struggled in public school from kindergarten through 4th grade. While in school, I was struggling with reading, writing, and math. I was so frustrated that I tried to cover my confusion by making jokes. I had no confidence and thought that I was dumb. “I finally had some answers when a psychologist diagnosed me. After we received the test results, the psychologist recommended Bancroft School in Worcester MA. So now I am at Bancroft in the Hope Graham Program for Dyslexia and ADHD. I feel so much more confident and comfortable. There are 7 kids in my class and I'm getting the right tools I need and learning how my brain works. Names hold a lot of power. We encourage you to help your child acknowledge and perhaps even celebrate the sliver of their identity that has made HGP a good fit for them. “Mom, I have all these ideas in my head, but I can't get them on paper.” I remember saying that when I was in fourth grade. I never wanted to go to school in 4th and 5th grade. I was bullied and I struggled in most of my classes. I never felt like I was good enough. Then I was tested and learned that I have dyslexia. This is my journey through dyslexia. “You may be wondering what is dyslexia? According to Merriam-Webster, “Dyslexia is a learning disability involving difficulties in acquiring and processing language.” In basic English what this means is that my brain learns differently when it comes to reading, writing and spelling. “I also learned that I am not alone. An estimated 20% of the population has dyslexia including some people you may have heard of. “Just because someone is diagnosed with dyslexia does not mean all dyslexics are the same. It doesn’t mean we read letters backwards, that we don’t know our right from our left and most importantly, it doesn’t mean that we are slow or not trying hard enough! “For me personally, dyslexia makes reading, writing, spelling and time management a challenge. “Reading had been the easiest of the 4 for me which is different from other dyslexics. In elementary school I was about 1-2 grade levels behind in reading up until 6th grade. That is when I came to Bancroft and the Hope Graham Program and learned specific strategies and skills. “Tools like active reading, ear reading, which is the ability to listen to books read aloud electronically, and Orton Gillingham tutoring have helped me to have a better understanding of what I am reading and how to be a better writer. Orton Gillingham is a unique approach intended to help individuals with reading, writing, and spelling. It teaches you spelling rules, syllable division, vowel teams, Latin roots, suffixes, prefixes, and what they all mean. Writing and spelling are still a challenge for me, but not nearly so difficult as before. “Before I came to Bancroft I was very determined to do school work on my own without any help which is a crazy idea. Because of my determination, it took me two weeks to write a memoir in 5th grade that took other kids only 4 days to write. Of course, if I had gotten help I would've gotten it done much faster and it would have been the same quality. It was difficult for me to understand my learning then because I would do really well on work but it would take me excessively long times and a lot more effort compared to others in my class. My teacher would even use my work as examples which always made it seem worth spending that amount of time on. “I would also spell things extremely phonetically and still do. Words that had the same letters in different orders confused me a lot too. The best examples are who, how, and why which do not have all of the same letters but are very similar. I don't think I could truly 100 percent always know which was which until 6th grade. “I have been in HGP since 6th grade and it has helped me grow so much as a learner and in my overall confidence. HGP has helped me realize that everyone learns best a different way and that what works for me is not always going to work for someone else. Dyslexia is something you will never grow out of and it means that reading and writing assignments may always take me a bit longer to complete, but with hard work, determination and specific strategies and tools, the sky's the limit! This past Thursday, Peggy Stern, Academy Award winner director and creator of Dyslexiaville, spent the afternoon with all of our Hope Graham Program students. Not only is Peggy a very successful filmmaker who credits her talent to her dyslexia, she is an immediately relatable and very candid speaker. So it was no surprise that she was able to spark deep thoughts and conversations among our students, focusing on their individual strengths. Peggy met with our HGP Middle School and Lower School students separately, but both groups were equally interested in this concept of strengths. One Lower School student seemed to have a spark of epiphany as he answered one of her questions, wrestling to find the words to express the fact that while students with language-based differences (LBLD) have a hard time learning to read, they are able to some things much more easily than their non-LBLD peers. Both groups then went on to think about and express their own strengths, some of which included: drawing, computers, animals, curiosity, hockey, thinking creatively, writing short stories, science, combining two things into one thing, learning facts, understanding the feelings of others, math, and soccer. The Learning Lab Method that Bancroft School teachers often employ offers all Bancroft students to learn through, practice, and showcase their strengths. A student might create a stop-motion Lego animation detailing their research on Myanmar’s educational system, compose and perform a song in the style popular during the Industrial Revolution, or research our school’s namesake and display their findings at Bancroft Tower for hundreds to see (all of these are actual projects). These projects, which offer student voice and choice and an authentic audience for student work, enable Hope Graham Program students to not only address their weaknesses, but to employ their strengths without limits. We encourage every parent of a student with a language-based learning difference to keep up an ongoing conversation going around your child’s strengths. If your child has a hard time identifying what they are good at, taking a look at their interests is a great starting point (even as children, we tend to gravitate towards activities that suit our strengths). This assessment from Headstrong Nation is also a fun way to map your child’s strengths. And remember to share what comes out of these conversations with your child’s teacher so that they can keep up the encouragement at school! 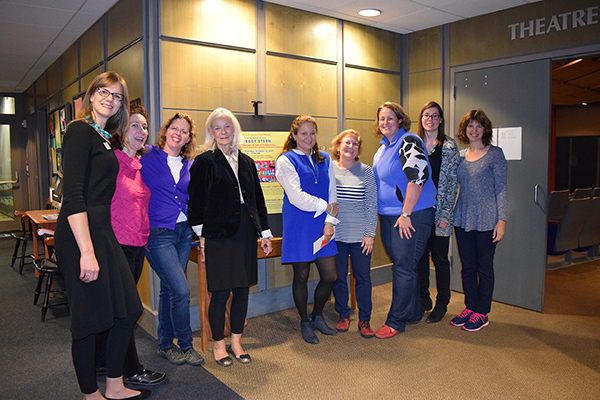 Hope Graham Program teachers with Peggy Stern (center) before her Bancroft Speaker Series presentation to an audience of parents, educators, and students about encouraging students’ strengths. As parents and teachers, we often notice that our students are able to speak about a subject with detail and ease yet fall apart when asked to write about that same theme. It is immensely important that our children develop strong writing skills that enable them to communicate their great ideas. Yet writing is arguably the most difficult academic task that we can ask of our children. For any of us to do a good job carrying out a task with a lot of component parts, like writing, we must master each of the component parts to the point that we can perform them without much thought. Our brains each have a limit on the amount of energy and attention that we can devote to any activity at any given time. The more automatic we are with one task, the more of our precious cognitive energy and attention we can devote to another. In writing, this means that if a student struggles significantly with handwriting, she will have very little energy and attention to devote beyond forming individual letters. Another student may be able to spell with relative ease, but if he lacks a strong knowledge of sentence structure, he will not have enough cognitive capacity to focus on organizing his composition in a way that makes sense. The skill with which the child has the most difficulty gets the most energy and attention, at the expense of all of the other skills required for strong writing. One way to get around such difficulties is through accommodations. Accommodating a student means opening up an access point to the curriculum without changing the teaching approach or the actual assignment. For example, students who struggle significantly with handwriting or spelling can utilize speech-to-text technology, voice recordings, or scribes in order to bypass these difficulties. For a student who finds it hard to plan or organize her writing, the teacher might break down the assignment and provide specific templates for her to fill in before drafting her composition. We accommodate students so that they can successfully complete the assignments in front of them. However, the ultimate goal is to provide instruction that decreases the need for these accommodations in the first place. In the Hope Graham Program, our teachers and tutors work with students on all of writing’s component skills, and students practice each of them until they are automatic. They work intensively on spelling during their language classes and tutorials, build on their understanding of sentence structure from Grade 2 all the way up through Grade 8, and practice planning and organizing their writing across all of the academic disciplines. This year, our HGP teachers are excited to be partnering with an occupational therapist so that they can help their students to develop stronger handwriting skills in the classroom. I invite and encourage you to share this information with your child the next time he or she experiences frustration with writing. Reflecting on which part of the process is breaking down can help students to feel empowered and advocate for themselves effectively. Writing is really hard, but by understanding which part of it is causing difficulty for a child, we can make it easier. Without a doubt, the daily instruction provided in the Hope Graham Program provides students with the skills that they need to decode and understand text. We help them to develop the neurological pathways necessary for accurate and efficient reading through the highly effective Orton-Gillingham approach. We provide modeling, guided practice, and opportunities for independent application of the best research-based comprehension strategies. And we engage our students in frequent fluency drills in order to build their reading speed, accuracy, and expression. While these underlying reading skills are absolutely necessary for our students to succeed, they are insufficient in their own right. Fitting with Bancroft’s mission to develop lifelong learners, the Hope Graham Program aims to empower students not only to know how to read well, but to become readers for life. Hope Graham Program teachers facilitate this progression by exposing students to all kinds of books at their “just right” level, encouraging students to ear-read (listen to) more difficult but engaging texts while reading along in a hard-copy text, helping students to make lists of books they would like to read, and providing opportunities for students to build reading stamina, both in school and for homework. In addition, as students enter the upper middle grades, they begin to track their “textual lineage,” documenting the books that have resonated with them and have therefore contributed to their growing sense of who they are as individuals. 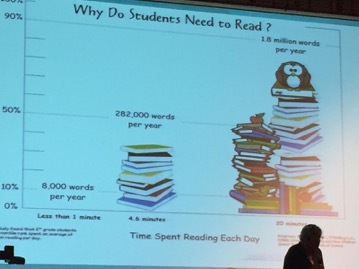 Incredibly, students who read less than a minute each day are exposed to 8,000 words in a year, while students who read for 20 minutes per day are exposed to 1.8 million words in the same period of time! All of those words translate to an expanded bank of word knowledge and familiarity that helps students to decode more accurately, read more quickly, and understand more deeply. If these figures make you worry that your child has missed out or is behind, don’t. Lifelong learners do not develop overnight, and it’s never too late for students to build a robust reading life. This is the work of a child’s entire academic career. Rather, we as parents, teachers, and students ought to feel empowered. The work we do each day helps to grow readers who love to learn through text, and who can speak with enthusiasm at the dinner table about the latest great thing they’ve read.